Pies & Coffee New Savoury Items, Singapore | JACQSOWHAT: Food. Travel. Lifestyle. Redefining the dining experience at Pies & Coffee with the following offerings. I personally love my soup in bread bowls and this Clam Chowder $9.20 didn't disappoint. White clams stir-fried with onions, carrots, potatoes and mixed herbs before fresh clam juice is added to the potpourri. All this goodness swims in the crusty bread bowl. For something light, this heartening soup is the perfect way. Probably the most cheesy dish I had, Lobster Bisque Baked Rice $14.90. Flower crabs, prawns and slipper lobsters lend a strong sweet note. Taking 6 hours to prepare, the lobster bisque sauce is a reduction of fresh flower crab, prawn and slipper lobster jus. Love the rich lobster bisque fragrant! Wagyu Beef Cheek Pie $11.90 served along with mashed potatoes at the side. This is an existing item on the menu but also a signature because of the tender and succulent beef cheek. Barbecue Chicken Pie in Beetroot Crust $11.90, it uses natural coloring from beetroot on the crust which results in a striking red color. Chicken leg were soft and tender while on the other hand, the bbq sauce and apricot jam were a tad too sweet for my liking. But I love the mash at the side! Yet another creative idea is infused in this dish, Charcoal Crust Curry Chicken Pie $11.20. Using the same part of the chicken leg as before, the richness of the curry is decent though could be better. On the other hand, the charcoal crust didn't brings out any taste. It's like a normal pie crust just that it's black. Yet another cheesy classic, Croque Monsieur $14.90. This olive-accented focaccia contains a medley of turkey ham as well as garlic turkey and is enlivened by bechamel sauce and mozzarella cheese. The dish is then capped off with a generous serving of pesto sauce, this tasty dish is indeed satisfying. The new items also include this Hungarian Beef Goulash Pot Pie $14.50. This Hungarian beef goulash has been stewed for more than five hours. Every bite of the tender beef was enjoyable, definitely my ideal definition of comfort food. This European-inspired creation is for you beef lovers. A favourite local flavour is incorporated in this dish, Curry Chicken Pot Pie $14.50. The curry leans towards the fiery side while the chicken is succulent and tender. The curry for this is slightly different from the previous pies, it's more flavourful in taste. While the crispy pie crust adds another dimension to this comforting dish, bread and curry is the best combination. 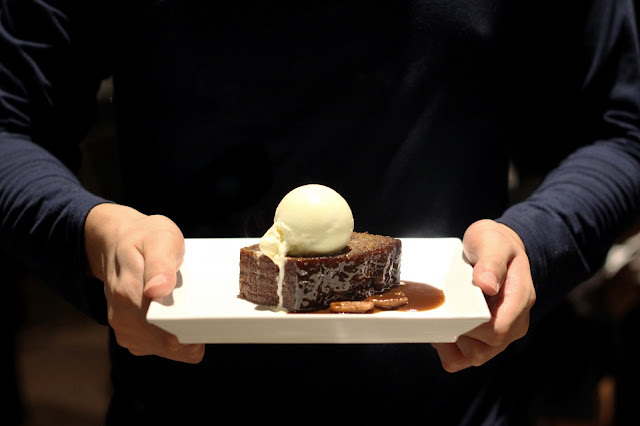 Sticky Date Cake $7.90 topped with of vanilla ice cream. Dates from the USA is finely chopped to create this decadent cake that is drizzled with homemade toffee sauce after. The rendition at Pies and Coffee isn't too sweet, while the cake is moist and dense. The kind of dessert I would love. Pies and Coffee is known for its array of buttery, shortcrust pastries and robust coffee blends. With the following new items, it is definitely more than just pies. With 4 outlets scattered around in Singapore, it is an ideal spot for light snacks and catching up with friends or work.